Finger euphorbia | Infonet Biovision Home. It has been naturalized throughout tropical Africa and commonly planted in both tropics and subtropics of Africa and Asia (India and the Far East). 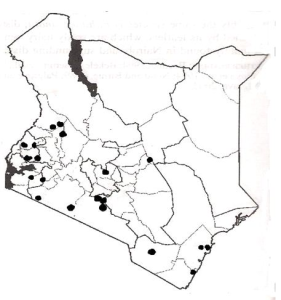 In Kenya is grown in dry as well as humid areas. Is very important in the drier hot areas where it grows to tree size. This tree is widely used as hedge mostly around homesteads and schools. The milky sap contained in this plant is corrosive and extremely toxic and contact with the skin may cause severe burning. Contact with the eyes may cause severe pain, and may result in temporary blindness for up to 7 days. In case of eye exposures, flush eyes with water for at least 15 minutes and seek medical attention (Human milk is most effective). Over-the-counter antihistamines can also be used for sensitive patients. If swallowed, it may cause burning to mouth, lips, and tongue. Deaths have been recorded from swallowing the sap and, if swallowed, one should seek medical attention. Optimum altitude is up to 2,000 m above sea level. Soil type: Appears to grow on almost any soil type and is spread in agro-ecological zones II - VI. It is mainly propagated by cuttings but seeds may also be used. Approximately 1m long cuttings are used and are planted close together. Initially, growth is slow but once established, they grow faster. For live fencing, trim and top-prune and it may need to be cut and replanted after some time. Coppices well. It may become a weed if not well managed. Medicine; improves the health of weak camels and fatten them. Fodder; good source of food for camels. Glue; it is locally used to paste papers together. Apiculture; it is a bee forage. Latex; is fish poison and used in making insecticides. Erosion control: Protects bare soil in dry areas from wind and water erosion. E. tirucalli fences can act as erosion breaks. Reclamation: E. tirucalli is very drought resistant and efficient in photosynthesis because of its unique photosynthetic physiology combining both the Crassulacean acid metabolism and the C3 pathways. It can be used in land reclamation programmes. In Zimbabwe plantations of E. tirucalli have succeeded in some instances at <5 000 p.p.m. in arsenic mine spoil mounds. Ornamental: Widely planted for ornamental purposes. 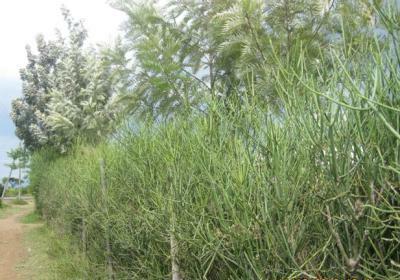 Boundary or barrier or support: E. tirucalli is an extensively used hedge plant in rural areas of East Africa. Intercropping: The finger euphorbia is an ideal species for agroforestry offering little shade and having many other uses. Shade; it is a good shade tree in dry, hot areas. Other services: The tree has a number of cultural implications in many African communities. The nematode Meloidogyne incognita infests E. tirucalli in India. Carter S. and Smith AR. (1988). Euphorbiaceae (Part 2). In: Flora of Tropical East Africa. AA Balkema, Rotterdam. Depeyre D., Isambert A. and Sow D. (1994). Latex plants, a source of methane. Biofutur. 136:25-28. Kokwaro JO. (1976). Medicinal plants of East Africa. East African Literature Bureau.